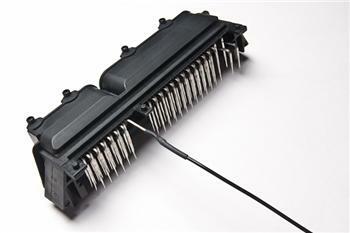 These connectors and terminals are found on the 04-05 Lotus Elise and Lotus Exige that utilize the T4 ECU. Radium Engineering is the only place that sells these and has them in stock. We also carry the mating connectors. These connectors, backshells, and terminals will connect to any 2006-up Lotus Elise, Exige, and 2-Eleven ECU. Radium Engineering is the only place that sells these and has them in stock. We also carry the mating headers. This is the 80-Way PCB header that is found in the 04-05 Lotus Elise/Exige T4 ECU. This product allows for a simple wiring harness to be constructed to adapt an engine management system or piggy-back ECU without permanent damage or modification to the factory harness. Pins can be straightened and directly soldered to. These ECU headers are not available anywhere else. Radium Engineering has them in stock along with the mating connectors sold separately.